Chinese or not Chinese -- that is the question! (Japanese? ):- I am Sue, a 58 year old grandmother that enjoys spending her weekends looking for bargains. I bought the item in question from a local car boot sale several years ago and have always intended on finding out from whence it came. It didn't matter to me whether it was a rabbit or a hare and, believe me, I have been subjected to other people thoughts on this subject for quite a while now! I started trying to identify the marks on the bottom of the "rabbit" approximately nine months ago and that's when I came across the first obstacle. Is it Chinese or not Chinese? How does one tell? Could it be Japanese? Round and round I went in circles, hours became days,days became weeks and weeks turned into months. Now here I am nine months later and not only have I been unable to identify the pottery mark but I can't even be sure of where it came from. China or Japan? I studied the symbols for hours and hours but all those squiggly lines seemed exactly the same to me(apologies to our Oriental cousins) and I was getting absolutely NOWHERE!!! How can I possibly identify where my lovely rabbit came from if I can't even identify the language and country? still trying to find out where her rabbit came from and also who made it. I did a "Google" search for help and up popped this wonderful website with promises of HELP. I have told you my story and I am sending you some pictures and would be delighted if one of you wise people out there could put me out of my misery. Thanks for the submission. 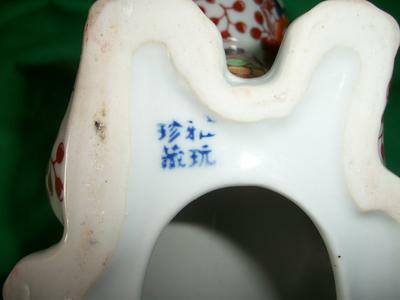 You are right, for the average Westerner, deciphering Chinese style lettering is difficult to impossible. The Japanese didn't have any writing up until a few hunderd years ago, so they adopted the Chinese kanji method. They then went on to develop many different writing styles, so, in effect, the same thing can be written in lots and lots of different ways. Not helpful. That's why we need either a native speaker or an expert (which I am not). 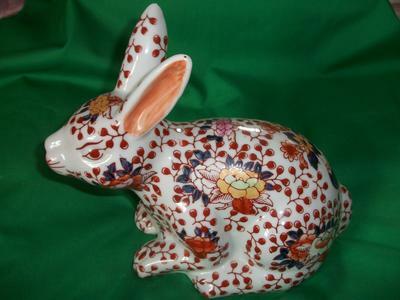 However, on first appearances, your hare/rabbit has the overall look of Japanese Kutani ware. I know how the characters of 'Kutani' are usually written on pottery marks, and none of your characters look familiar at all. SO that's not helpful. Hopefully, now we have published your query (sorry for the bit of a wait), we can get some help on this.